The Charles Ede Essay Prize was established in 1999 by James Ede in memory of his father. Charles Ede (1921–2002) was the founder of the Folio Society in 1947, publishing handcrafted, limited edition books. In 1971 he established Charles Ede Ltd, a leading London based firm dealing in Classical and Pre-Classical Antiquities from Greece, Egypt, Italy, Cyprus and the Near East. The Prize is awarded for the best piece of written work (essay or significance assessment) by any student currently enrolled at the University of New England, including postgraduate students. The work must have as its research focus one or more objects in the UNE Museum of Antiquities (UNEMA). No specific topic is provided. The work may have been submitted as part of a course in an academic unit. The word limit is 2,000-3,000 words for an essay, or 4,000-7,000 words for a research significance assessment. 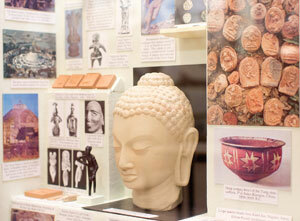 Essays must be submitted by email to the Curator of the Museum of Antiquities at bhopwood@une.edu.au. The email should use a clear subject line e.g. : "UNEMA Charles Ede Essay Prize". The prize and its recipient will be determined by the Museum Governance Committee at the first committee meeting to follow the end of Trimester 2. Essays received prior to that meeting will be considered. Essays received after that meeting will be considered in the following year so long as the candidate is a current UNE student. The written work must be submitted as a single PDF. Handwritten work is not permitted. Photographs, diagrams and other appropriate visual material are acceptable inclusions in your essay. All visual material must comply with copyright laws and regulations. Any permissions required to use such material is the responsibility of the entrant. The Museum of Antiquities (UNEMA) reserves the right to publish or make use of all entrant submissions in ways that are appropriate to the role of the Museum of Antiquities. By submitting an entry entrants agree that the Museum may make use of the submission without restriction. By submitting an entry entrants assert that they have complied with all copyright laws and regulations. The adjudicators' decision is final. No discussion about the entries or decision will be entered into. The winner of the Charles Ede Essay Prize will be notified as soon as possible by the UNEMA Governance Committee.